We’re starting to get a few days that are warm enough to get out and some of them are coming without rain. I finally got to sit on my tripod stool, in the corner of a parking lot, and draw this house. I was working more quickly than normal but thoroughly enjoying the process. A couple people came by and we talked about spring finally arriving and I felt that finally, really, really, it had. Hope you like this sketch. I hope to be presenting a lot more of them in the coming months. Gosh, it’s been a while since I’ve posted. I’ve been in a bit of a funk lately, maybe because winter just won’t leave us (it’s snowing right now) and I haven’t been sketching as much as I normally do. A group of us did go out to one of the plant nurseries for a day of sketching, though, and I was attracted to a collection of plant boxes. It’s not a fancy scene as the boxes were sitting on simple boards supported by concrete blocks, but I found the shapes interesting. Here’s that sketch. Hope you like it. Hope we get some decent weather soon, too. Several recent posts featured sketches I’ve done at the Quebec Federation of Hunters and Fishers museum. Most of those sketches have been of birds, mammals and fish. The museum is a wonderful place for drawing these subjects because the people are friendly, the lighting good, and the displays rival those of any natural history museum. 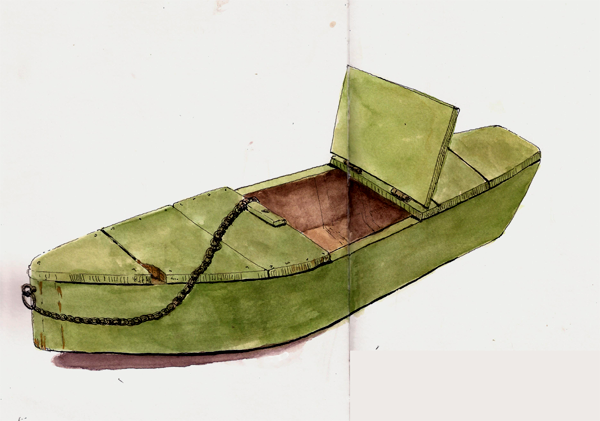 Because of all those animal subjects available, it’s been hard for me to draw any of the other objects they have on display, but I’ve eyed this “boat” every time I’ve visited. It’s not really a boat at all. It’s a homemade live well, used to hold fish. Its bottom is made of screening so that water can enter. It’s only about two feet long and truly a beautiful piece of folk art. Hope you like it as much as I enjoyed drawing it. A large producer of bicycles and bike gear is Garneau, Inc. and they are based in Quebec. They have a factory and store just outside of town and associated with it Garneau has a small bicycle museum. On display are really early vintage bicycles and tricycles, some made entirely from wood, but also some Schwinn bikes I had as a kid. I guess that makes them ‘early vintage’ too. Our group went there yesterday and we had a great time. There were six of us, which was just about right for this small single-room museum. Guylaine sat down to draw a Schwinn Stingray bicycle. It’s classic banana seat and high-rise handlebars brought back lots of great memories. 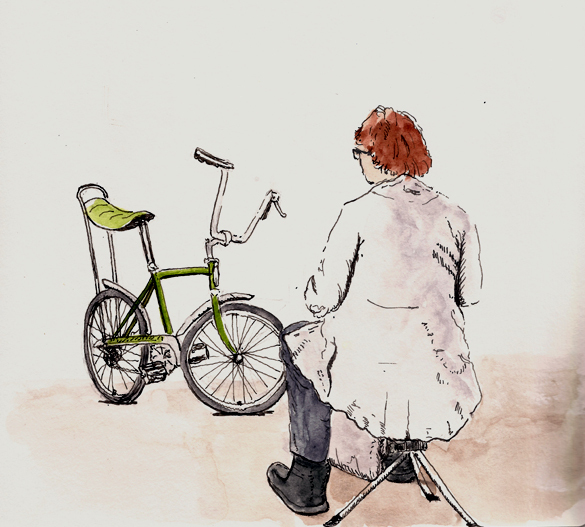 I decided that rather than drawing a bicycle alone, it would be fun to draw Guylaine drawing the bicycle. Here is my attempt at that. I find wooden bicycles to be quite marvelous. 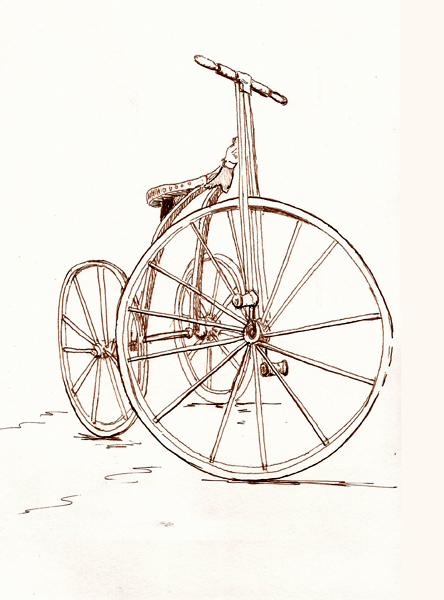 The museum had quite a number of them, but I decided to draw this very large (front wheel is 29″dia) tricycle. The amazing thing is that aside from the wheel bearings, rear axle, and pedal crank, the only metal in the bike is a y-shaped yoke that connects the body frame of the bike to the fork/handlebars. Since it was all wood, I thought it fitting to draw it with brown ink so I used a Pilot 78G with DeAtramentis Document Brown ink for this sketch. Oh my goodness. It’s been ten days since I’ve posted. I’m running as fast as I can but it just isn’t fast enough. I’ve done some more extreme sketching, went to a gathering at the Morrin Center in Quebec City, my daughter came home for “reading week” and we just got back from Montreal where I got to spend the day with Marc Taro Holmes. I’ll try to get blog posts written on all these things in the next couple days, but today I want to show you a couple more sketches that I did when several of us went back to the Quebec hunting and fishing museum. I was struck by this duck because I had never seen one before and I didn’t know what it was. There was no label on it. 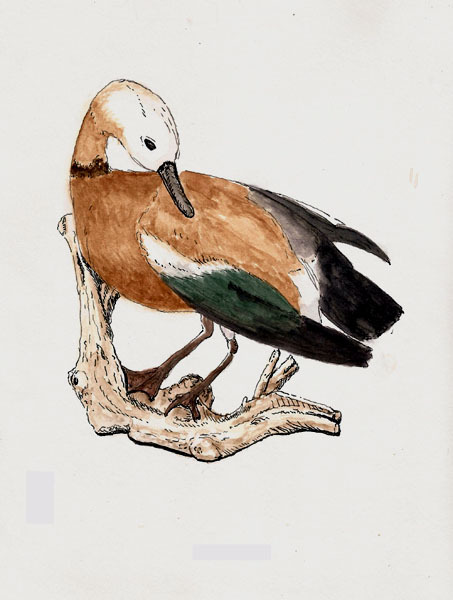 I drew it because of its atypical orientation but it wasn’t until I got home and talked with Mr. Google that I found out that this is a a Eurasian duck called the Ruddy Shelduck and that it’s very common in India. With so many beautiful animal subjects at the museum it’s easy to ignore the multitude of antique and modern fishing and hunting equipment on display. 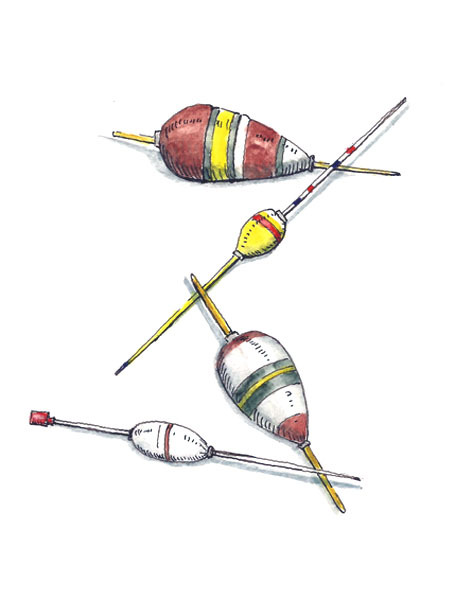 But on this day I was struck by a long row of antique fishing bobbers, or floats if you prefer that term. While they did have an example of modern, red/white plastic bobbers, most of them were very old, wooden bobbers. Rather than drawing them in a row, I created this composition and liked the result. Hope you do too. 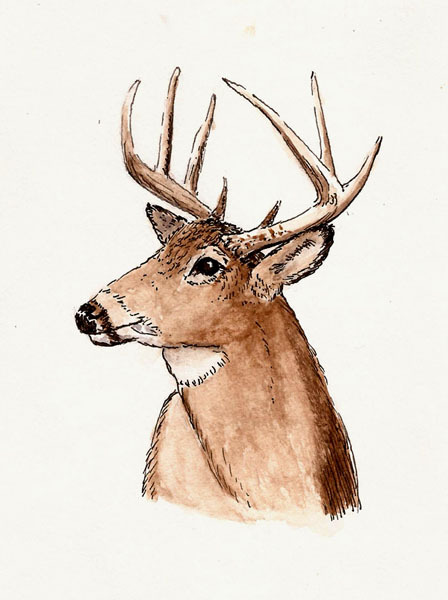 I decided to draw one of the deer and I struggled to get the antlers right. And I didn’t. I find some days I just ‘see’ better than other days. Not sure why. When I finished that I wandered around a bit. There’s so much to see and study there. Eventually, though, I settled down in front of a couple Canada Geese. By the time I got them drawn it was time for lunch and we all got together, shared our projects, and chatted up a storm. 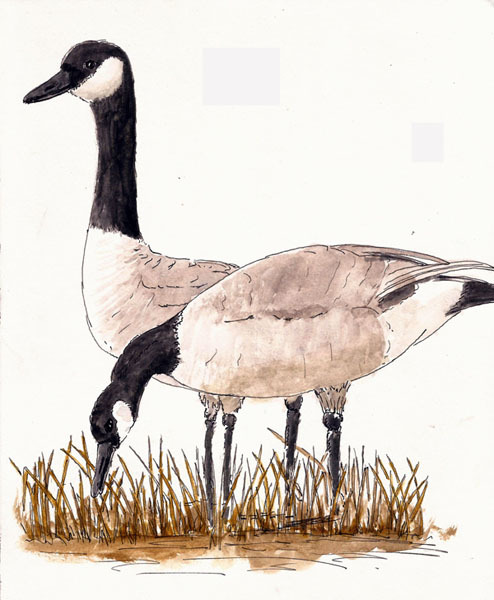 Then I added color to my geese. I’m sure we’ll go back again, and probably real soon. Next stop, though, is the Croquistes de Quebec sketchcrawl. ​des chasseurs et pêcheurs. This is a bit outside the domain of CALAVQ, which is primarily a portraiture group, but Daniel has been organizing more and more of these events and it’s very exciting to see. I didn’t know that the Quebec hunters and fishermen had a museum/training center but this place is incredible for those of us scrambling to find winter sketching places. It’s a bit of a drive but access is free, though they appreciate donations. There is a lunch room with microwaves, vending machines, etc. AND several hundred taxidermy specimens just waiting to be drawn. The hard part was deciding what to draw and being satisfied even though you didn’t get to draw everything. 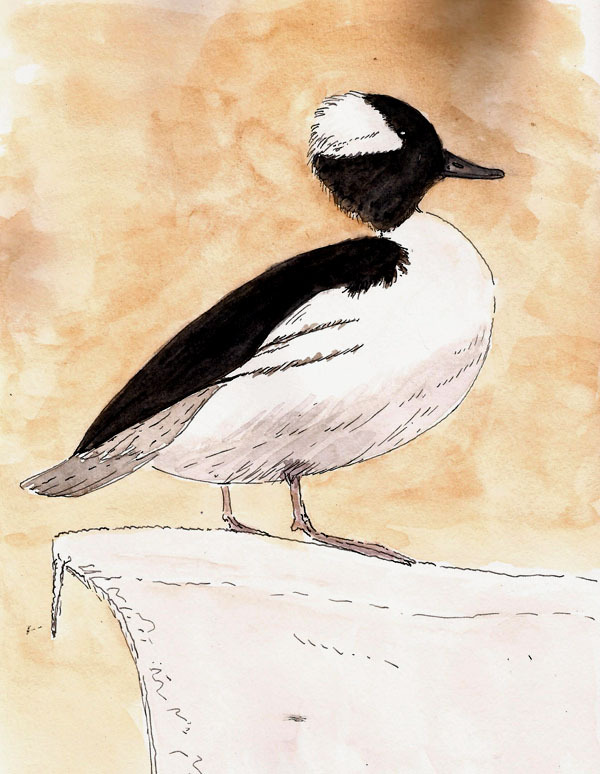 I moved onto the wildfowl area and drew this elegant bufflehead. Here I bumped into my watercolor ineptitude and had trouble obtaining a really dark black, but I was generally happy with the result. Robert Bateman I am not. After lunch I decided that since I’d drawn fur and feathers that it was time to draw a fish. I like the small vignette surrounding this one. 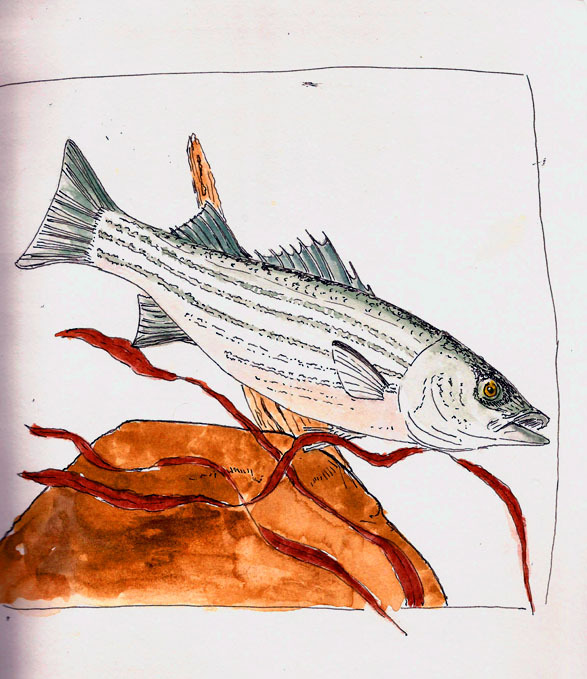 Striped bass used to be common to the stretch of the St. Lawrence River around Quebec but they had nearly disappeared until the fishing and hunting organization started a program to build up their populations. They are being grown and planted along the river and fishing regulations prohibit the taking of this fish. From what I could read, the program is making good progress towards their reintroduction. I slowed down just a bit, partly because of my early morning lesson and partly because I was just getting tired. I think the result was more in tune with my norm…only a few mistakes (grin). Thanks to CALAVQ and particularly Daniel for organizing this event and introducing us to the museum. We’re heading back here on Tuesday. We made a quick sketching trip across the St. Lawrence River, back to Maison Alphonse-Dejardins last week. With the holidays rushing towards us I entirely forgot to write about it so here’s the abridged version. We went. We were there. We had fun. 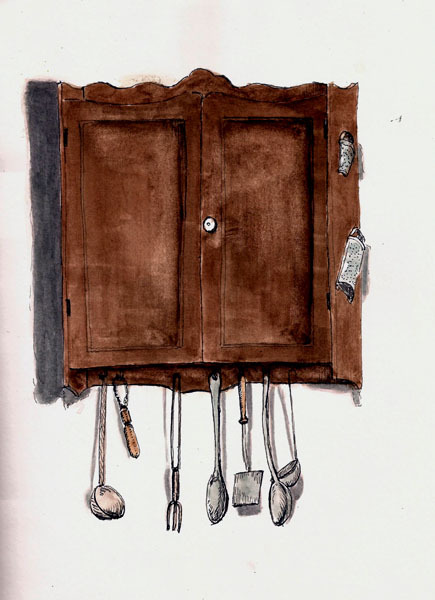 I drew a cabinet hanging on the kitchen wall, mostly because of all the goodies hanging from it. 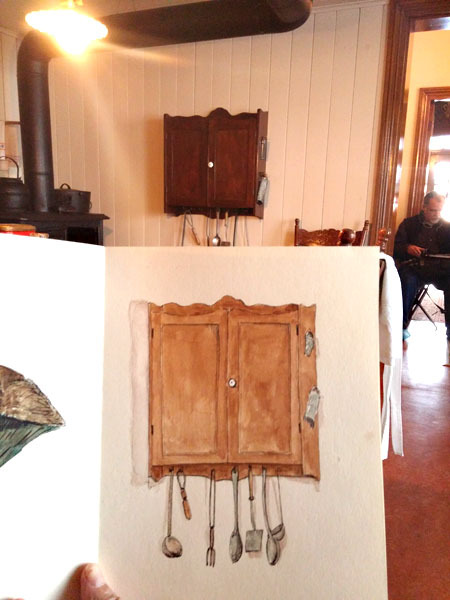 I shot this photo of sketch and cabinet as I waited for the first bit of paint to dry. Once dry, I added more color and this was the result. I mucked up the shadows but nobody’s perfect 🙂 Done in a Stillman & Birn Beta (8×10) softcover. I’ve fallen in love with these sketchbooks. 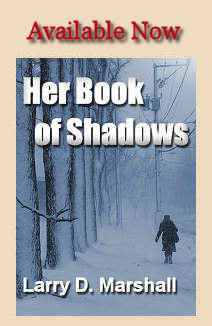 Same great paper as my hardcover books but at almost half the weight. 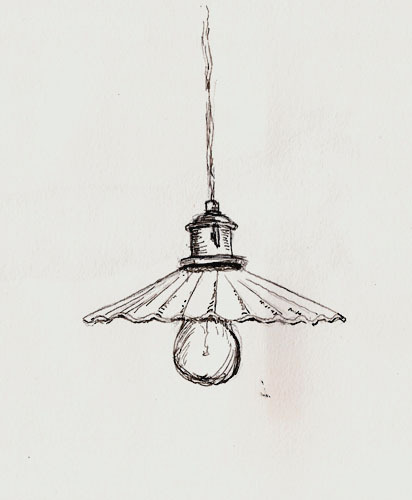 I thought I’d throw in this small sketch I did of one of the lights in the house. I did it quickly a few weeks ago while waiting for others to finish up. It was great to get out sketching on location again, in spite of the snow and the cold. I suspect I’ll be returning to Maison Alphonse-Dejardins this winter. In recent weeks I’ve had to forsake urban sketching because it’s just too darn cold outside and so I’ve started doing domestic sketching (my name for studio sketching as the opposite of urban sketching) and historic sketching (drawing from old photos). 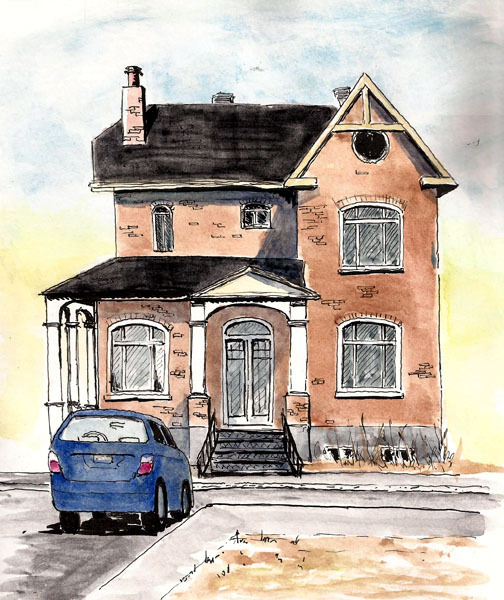 Seems there is jargon-ese convergence in what I present today – historic, domestic, urban sketching. Yvan and I braved the cold and took the ferry to Levis, where we climbed the hill and made our way to Maison Alphonse-Dejardins. Dejardins is the guy who started the Quebec banking system and his home is now a museum in his honor. I was on location and sketching and thus, I was an urban sketcher again. 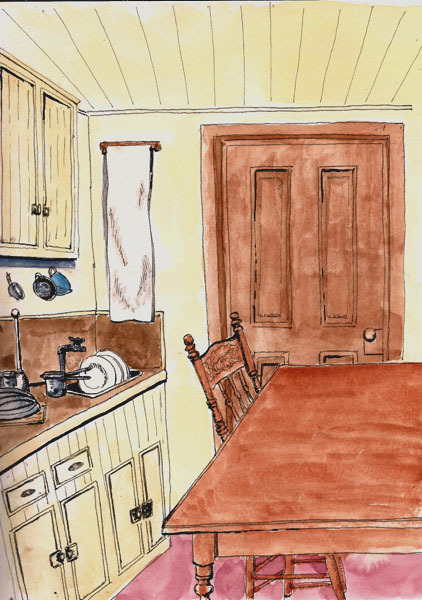 But this time my target was the sink and counter in the smallish kitchen in this home. Next time I’ll do the coal-fired stove cuz it’s a dandy. And in one swoop, this sketch is both historic and domestic. 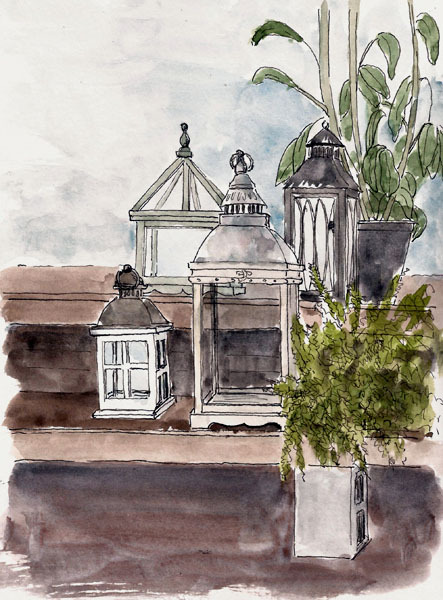 Voila, I did historic, domestic, urban sketching (grin). I know, I’m being silly, but then the labels we put on everything, and worse, the debates over what qualifies as fitting a label are pretty silly too. Anyways, here’s the sketch I did in a Stillman & Birn Beta (8×10) softcover sketchbook. I kinda let the perspective get away from me but what the heck, if they were all perfect there’d be no reason to continue trying. Last Sunday was our monthly sketchcrawl. We were to meet at a historic house, the Maison Alphonse-Dejardins, on the south shore of the St. Lawrence River in Levis. I was excited to visit the place and thankful that Yvan had arranged for us to sketch there. Early Sunday morning, I set out on a walk to the ferry that took me just a bit less than an hour. The ferry took 10-15 minutes to cross and then I had to climb a cliff (a gazillion stair steps are provided) and then into the older part of Levis where the house resides. I was there at 10AM. The air was crisp, which is a fancy way of saying I was glad I was wearing gloves, but I knew that people would be showing up soon. But they didn’t. Nobody came. In fact, the house itself was dark. I began to wonder if I’d written the date wrong. Cell phones are handy at such times and the website announcement made clear my error. Because of the house’s Sunday schedule, it didn’t open until the afternoon so the sketchcrawl was scheduled for 1PM. @#%$!! And so I walked to the stairs, descended the cliff and walked to the ferry. I crossed the St. Lawrence and walked home. I didn’t do the math, though, and when I arrived at home I realized that to get back to Levis by 1PM, I’d have to leave in… about 10 minutes [sigh]. I gave some thought to not returning but being the devoted sketcher (or fool – you decide) I put my coat back on and headed out the door…to walk an hour, take the ferry, climb the cliff, and make my way to the house. I made it but since I’d been on the move from 8:30 to 13:00, I was exhausted and wasn’t much in the mood to sketch. I just wanted to sit down. The house, though, is sketcher heaven if you like sketching items you’d find in a Victorian house. It’s a place I’ll be going to several times this winter for just that reason. 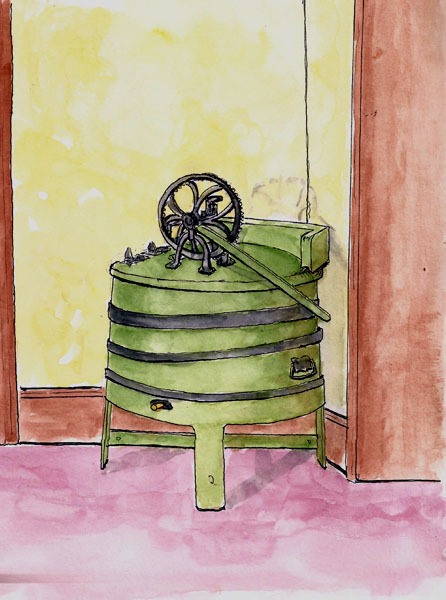 But on this day I found myself in the kitchen and in one corner there was a wooden, hand-agitated washing machine. It had been semi-restored as a display piece but the staves that made the body of the machine had been glued together and the metal bands that would normally hold everything together were placed, somewhat askew, just for show. I couldn’t look at it without seeing it as a cartoon and so, channeling Gary Larsen as best I could, I drew it as such. It’s not my best work but I had fun doing it which is my criterion for success. And I only had one more trip between the Maison Alphonse-Dejardins and my place. I went to bed early that night.